Aam ka panna is an Indian drink made from green mangoes and is consumed as a healthy drink to fight against the summer heat. A drink which is consumed in North India as a treatment for gastrointestinal disorders. 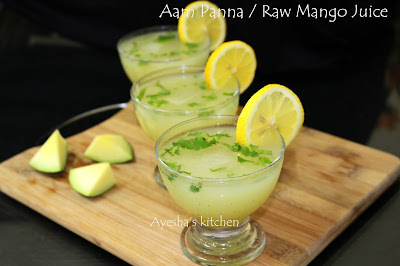 In India, it is believed that this can increase the resistance against Tuberculosis, Anemia, Cholera..
Aam ka panna / Raw mango juice can be prepared in different ways. Here is my recipe showing how to make this sweet spicy thirst quencher. Always use sour mangoes for making this drink. If not, don't worry you can add some lemon juice for the sourness to balance the taste. So here is the recipe of the summer drink using raw mangoes. Cut the raw mango into 2 big pieces. Do not peel the skin ( must). Pressure cook it for 2 whistles or until done along with some water . When done, remove the pulp alone (once it is cooled only). Blend the pulp along with water in the pressure (if any) until it forms a fine smooth puree. Transfer it to a bowl and add black salt (it is must), sugar, roasted cumin powder, juice of ginger and give a fine mix. Chill for few hours or until cool. While serving take 1 or 2 tbsp of this syrup to a bowl and mix it with ice cold water (2 cups or add accordingly) and serve with ice cubes, mint leaves, lemon.. If the raw mangoes you used are with less sour, you can add some lemon juice along with the spices to balance the taste. You can store this syrup for a week when refrigerated.